With the advent of software samplers, more musicians have now got access to sophisticated sampling technology via their Mac or PC, and while many are happy to use commercial sample libraries, there are all sorts of reasons why creating a sample program from scratch might be the way to go. Creating your own, unique sampled sound can be satisfying and can give your music a truly original element; and it may be that no commercial library includes the sound you're after. In addition, many musicians moving to software-based setups still have patches on older hardware synths they'd like to take with them. However, creating a convincing sample program from an instrument can require a lot of detailed work, and that's where applications like Skylife's Sample Robot come in. Sample Robot is designed to capture sounds automatically and convert them into multisampled instruments, including the creation of velocity layers — and if the source of the sound that you wish to capture is a MIDI synthesizer, it can carry out the whole process virtually without human intervention. A Sample Robot Project can usually be thought of as a place to capture a single sound program from the target synth. Users can specify the range and spacing of MIDI notes to be sampled for each of as many sample layers as required. Within each layer, different settings for velocity and MIDI controllers can be specified, as can the note and release lengths. 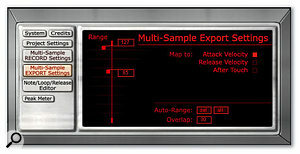 Settings can also be specified to automatically create loop points within the samples. With all the settings made, the recording process can be triggered and the entire process then happens without further user intervention. Sample Robot's Keyboard window is used to specify the keyboard range and note intervals to be sampled.For some, this will be more than enough to make Sample Robot interesting. However, it also has a couple of other tricks up its sleeve. First, while you forgo some of the automatic elements of the process, the Sample Robot interface provides a well organised environment for multisampling real instruments, which is great for those who really do like a genuine DIY approach to sampling. Second, the 'Import Single Sound Library' function streamlines the process of extracting samples from audio-format sample CDs. Where a single audio track contains multiple samples, Sample Robot will separate out each sample and map them to a range of MIDI keys. Of course, all these captured samples are only of any use if they can then be exported in a format suitable for your favourite software sampler. 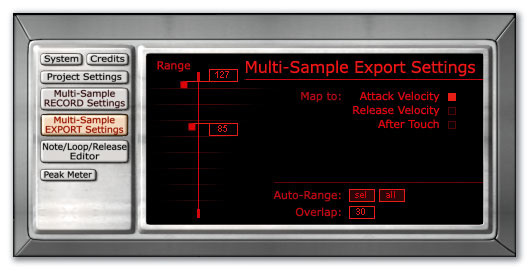 In the current release version (v.1.32), sampling is restricted to a maximum of 16-bit resolution, and export in raw WAV, Halion and Soundfont 2 formats is provided. I did most of my testing with Steinberg's Halion 3 and, on the whole, the process is very straightforward. Christian Halten, Sample Robot 's designer, informed me that other export options are in development, with R eason NN-XT support to follow shortly and discussions ongoing with a number of the other major software sampler manufacturers. 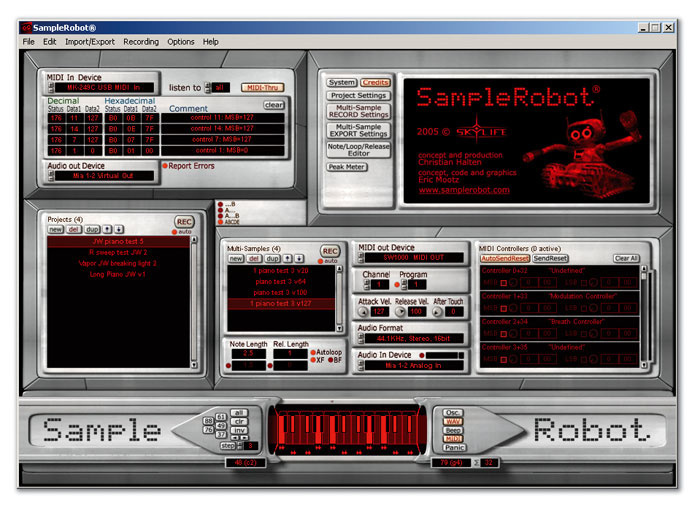 That said, many people will probably be happy with the benefits Sample Robot brings in capturing the samples, even if they then have to use the WAV files to build their own programs within their sampler of choice. Installation of Sample Robot proved simple enough. The software uses a challenge-and-response form of copy protection which worked without a hitch on my test system. It operates as a stand-alone application and, as shown in the various screenshots, the user interface is split into five main areas. Top left is the MIDI monitor window. Here the user can specify the MIDI In and Audio Out devices to use, while the bulk of the display provides a means of checking MIDI activity. Beneath this, the currently open Projects are listed in the Project window, where they can be created, duplicated or deleted. Once a Project has been configured, the Rec button at the top right of this window will trigger the automatic recording process. Projects can consist of either a single sample layer or multiple layers. The layers themselves are created and configured using the Multisample window in conjunction with the MIDI and Audio Settings window and the MIDI Controller window, which are located in a strip to the right of the Project window. The Multisample window lists the layers that exist within the currently selected Project, and allows you to create, edit and delete them. The rest of the settings within this section of the interface all specify the properties for the selected layer. These include Note Length, Release Length and the Attack, Release and Aftertouch values. Usefully, the MIDI Out device and channel and program number can also be specified for each layer, allowing you to (for instance) create a velocity crossfade between different synth sounds by specifying different program numbers for particular velocity layers. The Autoloop settings take some getting used to but the results can certainly be worth the effort.The MIDI Controller window allows settings for any available MIDI controller to be set for a particular layer, which might be useful if the character of the sound you are trying to capture depends heavily upon particular properties of the original synth. Once captured, Sample Robot layers could then be used to crossfade between different controller settings within your software sampler. The bottom of the display contains the virtual keyboard window, which can be used to specify the range and pitch of notes to be sampled for each layer. Again this offers considerable flexibility, allowing the sampling to be as sparse or detailed as required. 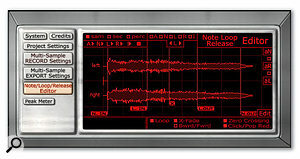 Modern disk-streaming technology sometimes means that long samples can be used to avoid the need for creating loop points. If loops are required, though, the editing involved can be very time-consuming. Thankfully, Sample Robot includes an Autoloop function which attempts to automatically create loop regions for each sample within a program. Loops can be set to either crossfade (the default setting) or to loop backwards and forwards. Detailed control of the loop-creation process is one of the functions provided within the Multi-purpose window which fills the top right of the Sample Robot display. As shown in the screenshot, the Multisample Record Settings page provides a range of options to change the way loops are created. The Multi-purpose window also provides access to the screens for the Note/Loop/Release Editor, Multisample Export Settings, Project Settings and a Peak Meter. 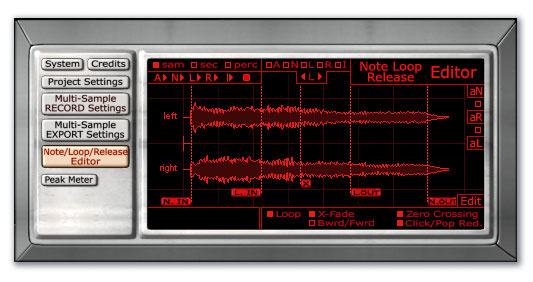 The Note/Loop/Release Editor allows the user to fine-tune the settings created by the Autoloop function for an individual sample. While the display is quite small, it is possible to zoom in on the region of interest, and all the parameters associated with the attack, loop and release sections of the sample can be adjusted. Usefully, users can reposition the in/out markers for the Autoloop search function and then re-run the search to find the best loops points. The Multisample Export Settings provides a way of specifying how the sample layers of a project will respond once exported. The most obvious task here is to define the range of velocities over which a particular velocity layer will respond and, again, Sample Robot can make these settings automatically for you, including specifying an overlap between different velocity layers if required. Pentium III 600MHz or faster, 256MB RAM, 30MB free hard drive space, Windows XP, MME-compliant soundcard, MIDI interface. Having browsed through the PDF manual (which is well worth doing), I tested Sample Robot with a number of different tasks, starting with the most obvious: sampling a sound program from a hardware MIDI synth. Creating a new Project and a series of multisample layers within Sample Robot is really a breeze, with the only real decisions to make being the number of velocity layers, the key range/interval to sample and specifying appropriate Note Length and Release Length settings. Having made the appropriate MIDI and audio connections, clicking the Project window Rec button brings up a small 'recording' dialogue, and the sampling starts once the Start Recording button is pressed. It is then simply a question of sitting back and letting Sample Robot do its thing for a couple of minutes. If the project includes velocity layers, their response can be configured via the Multisample Export settings.In capturing a variety of different sounds in this fashion, including piano, pad, bass and lead sounds, aside from an very occasional individual sample that didn't seem to get recorded (but which could easily be captured by repeating the recording process), my only initial difficulty was getting smooth results with the Autoloop settings. These require some experimentation in order to find the most suitable settings for a particular type of sound, and while the manual describes the controls in some detail, I felt that a few tutorial-type examples might get new users off to a quicker start. However, a little perseverance brought considerable improvements, and as the whole automated sampling process is so efficient, it is no great loss if a little trial and error is required in order to get a smooth loop for a particular sound — it certainly beats creating loop points manually! Exporting Projects to Halion also proved very straightforward. Selecting 'Export Selected Project To Halion' from the Import/Export menu renders the samples as WAV files to disk and places the mapping information within the Windows clipboard. It is then just a question of pasting the mapping information into a suitable empty program slot in Halion. For Sample Robot Projects based upon multisamples and velocity layers, this worked very well. Things are slightly less straightforward for programs that contain, for example, a mod wheel 'layer' from the source instrument. These layers require a little work within Halion in order to set up a mod wheel-controlled crossfade, but this procedure is clearly explained in the Halion 3 manual. With an appropriate MIDI loopback connector and audio routing, I was also able to use Sample Robot to capture sounds from various software synths. While it might seem pointless to sample a sound that already exists in a software form on the host PC, this could be useful if you wished to bring a selection of sounds into a single sampler front end, particularly with a laptop setup that might be used in a live context. Anyway, it works well enough for those who might need it. If you need to get down and dirty with your loop points, Sample Robot provides a small but perfectly functional editor for the task.Sampling an acoustic instrument is, of course, a somewhat more labour-intensive task, but Sample Robot does make this task a whole lot easier than it would be using a conventional audio recording and editing application. Finally, I was also impressed by the 'Import Single Sound Library' function. Though it's a fairly simple offering, simply breaking a single audio file containing several samples into individual samples each mapped to a specific key, even this helps to reduce the 'chore' of dealing with audio-format sample CDs. This said, it might be nice if this feature could be expanded in scope in future releases. For example, the ability to split a series of drum samples from an audio file and stack them on a single key with velocity response would be useful. In addition, the ability to automatically trim drum loops from an audio sample collection to exact bar lengths would be a big time-saver. In using the current release version of Sample Robot (v.1.32) for the review, there were a couple of other minor niggles. First, the screen layout is quite busy and I was occasionally having to squint to check what I was doing. This is particularly true within the Note/Loop/Release Editor window, even with the ability to zoom in on the waveform display. Second, there was no support for ASIO drivers, although in most cases this would not be of any significance as real-time response is not required when automatically recording samples from a MIDI module. However, just as I was finishing the review, Christian Halten provided me with a beta of version 1.5. Amongst a number of tweaks and additions, this includes options for resizing the display and the beginnings of support for ASIO and 24-bit audio, and although both of these are not yet fully implemented, development is clearly moving on at some pace. Sample Robot is a very clever application and, while it is probably too expensive and too specialised to appeal to the merely curious, it could save a huge amount of time and effort for dedicated sample-heads. My only reservation would be the somewhat limited range of Export options, but even if you just used it as a means of capturing your multisamples in an organised fashion before building your sample programs from the raw WAV files, Sample Robot would be a big time-saver. Sample Robot is clearly useful for those wishing to move some classic hardware sounds into the software realm, whether for studio use or to streamline a live setup. If Skylife are successful in their plans to add export support for more of the major software sampler formats, then Sample Robot ought to build a dedicated following. At the time of writing, Sample Robot is only available on-line, but a boxed version is in the pipeline, and will soon be available worldwide via ESI Pro's network of distributors. Anyone interested should download the demo version from the web site without delay! Generally very easy to use. Can save a huge amount of time when sampling from scratch. At present, a limited range of export options. Probably a little expensive to appeal to the hobbyist. If you are a dedicated DIY sample creator, then Sample Robot might just change your life — it's a real 'Swiss Army knife' for creating sampled versions of hardware synths. ESI Pro UK +44 (0)1280 847525.